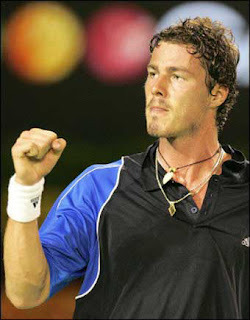 How good was Safin? He destroyed Djokovic and must be a (dare we say it) favourite now. Safin now favourite to win quarter? How bad was Ivanovic? If not for the netcord she’d be on a plane home and she knew it, hiding her face in her hat. Her quarter is still wide open with a dismal Vaidisova giving up against Stosur and losing nine games in a row before finally regaining interest and skipping home against an opponent who could only watch. Maybe this is Chakvetadze’s quarter after all.